For 80 years, over-the-air television signals have been broadcast in analog format. But a new federal law in the USA mandates that television stations must broadcast in digital format only, beginning February 17 June 12, 2009. This FAQ will answer your questions about digital TV, who is affected by the analog to digital switchover, and what you'll need to do. If you have an older TV with an analog tuner, AND you use an antenna to receive over-the-air signals, you ARE affected. If you get your TV signal from a Cable, Satellite or Fiber-Optic service provider, you are NOT affected, even if you have an analog TV. If you currently receive analog cable service (with no set-top box) you can continue to do so for at least three years after the cutover on 2/17/2009 June 12, 2009. If your television has a digital tuner, you are NOT affected. Is My TV Analog or Digital? So how can you find out if your TV has a digital tuner? Usually, there will be some indication on the TV itself, or in the manual. Look for the words "Digital Tuner," "DTV Tuner," "HDTV Tuner," or "Digital Receiver." The US government has required that all televisions shipped into or within the United States after March 1st, 2007 must contain a digital tuner. But what about old models hanging around on store shelves? Another requirement states that all TVs sold after May 25, 2007 must have a digital tuner, or be clearly labelled as not having one. So if you bought your TV within the past year or so, it's almost certainly digital. Here's another way to check if you have a digital tuner. Many stations are already broadcasting in digital, on the UHF band. Contact your local TV station and find out what channels contain digital broadcasts. If you can tune into those channels, you've got a digital TV tuner, and you don't need to do anything. Still not sure? Get the make and model of your TV and check it out on the manufacturer's website, or ask at a local electronics store. Will I Need a New TV? So you have an old analog TV. Should you toss it out and buy a digital TV? Not necessarily... You can keep ol' Bessie until she kicks the bucket, as long as you install a digital-to-analog converter box. (This is NOT the same as a cable set-top box.) The digital-to-analog converter goes between your antenna and the TV, and will convert the new digital broadcast signal to an analog signal that your analog TV can understand. And there's no reason you can't keep those old TV's in the basement or your camper, with a VCR or DVD player hooked up. Without the digital-to-analog converter, they won't get a TV signal, but you can still use them to watch movies. How Do I Get a Digital to Analog TV Converter? You should be able to find these digital-to-analog converter boxes wherever TVs or electronic equipment is sold, for around $40 to $70. But you won't have to pay that much, because the government will provide every household with two $40 vouchers, good toward the purchase of these converter boxes. To request your vouchers, visit the NTIA Digital-to-Analog Converter Box Coupon Program website, or call 1-888-388-2009. Do I Need Some Fancy Digital Antenna? Your existing antenna should not have to be replaced, as long as you are currently able to receive UHF channels. What About My VCR, DVD Player, etc? Your VCR, DVD player, camcorder, gaming systems and other equipment that interfaces with your television will continue to work, no matter what kind of TV you have. One thing to consider about your VCR, if you currently record TV shows. The digital-to-analog converter box will only convert one channel at a time. So if you want to watch digital TV on one channel, and record something on another, you'll need TWO converter boxes. To make this work, you'll need to connect a splitter to the signal that comes from the antenna, then connect one output to the converter that feeds TV and the other to the converter that feeds the VCR. You'll also lose the ability to do automatic timed recording, unless you get a converter box with a built-in timer. Why The Switch to Digital TV? To people who have older analog-only television sets, and rely on free over-the-air signals, the switchover from analog to digital may seem like a nuisance. So why is the government mandating that all television broadcasts be transmitted in digital format? Part of the reason is that the FCC wants to make better use of the broadcast spectrum currently being used by analog television signals. Some of this spectrum will be licensed to companies that provide consumers with wireless broadband. And other frequencies will become available to emergency services such as police, fire departments, and rescue squads. And part of it is keeping up with the times. Parts of Europe's TV broadcasting is digital already, and aside from national pride, digital broadcasting does provide better audio and video quality, in a more efficient manner. With digital multicasting, TV stations can transmit several channels at the same time, in the same broadcast spectrum. In addition, digital TV allows for interactivity that is not possible with analog technology. Does This Affect ALL Television Broadcasts? No, there are a few exceptions. The switch from analog to digital only applies to full-power TV stations, which use the public airwaves for over-the-air broadcasting. Local "low-power" and "translator" television stations in certain rural and urban areas can continue to broadcast in analog format indefinitely. But there's one possible snafu... Some digital-to-analog converter boxes lack a feature that allows the low-power signal pass through to the analog TV. If you need to receive BOTH digital and low-power TV signals, make sure you get a converter box that has the "pass through" feature. No. Standard-definition TV can be broadcast in either analog or digital format. And surprise... High-definition TV (HDTV) can also be broadcast in either analog or digital format. A "digital TV" is not necessarily HD-capable. Just remember, the "D" in "HD" does NOT stand for digital. At some point in the future, all television channels will broadcast in High-Definition, but that's not likely to happen any time soon. 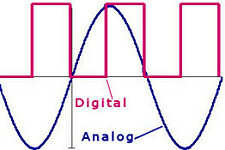 Here's a little semi-technical information on the difference between analog and digital TV signals, and why a digital signal is preferable for television broadcasting. An analog signal is a continuous electrical wave that varies in response to changes in the sound or image being transmitted. A digital signal is a sequence of pulses. The original information is converted into a series of ON/OFF signals (bits) before being transmitted, sort of like Morse code. Why is digital better? Digital signals can be sent for longer distances and are less prone to interference than analog signals. And since a digital signal is just a string of numbers, it can be reproduced exactly, an umlimited number of times. By contrast, analog signals cannot be copied perfectly. Each copy of an analog audio or video recording will have deterioration. My previous article Goodbye to Analog TV has some additional information on this subject, as well as many interesting user comments. The US Government's DTV.org website is a good source of information about digital TV and the analog to digital conversion. See also the FCC's Consumer Facts About DTV site. And if you need a digital-to-analog converter, see the NTIA Digital-to-Analog Converter Box Coupon Program website. Got comments or questions about the analog to digital conversion? Post a comment below. Most recent comments on "Analog to Digital TV Conversion"
Is there any hope at all for my little battery operated Sony portable TV? I love that little thing, I can take it anywhere. But I have a feeling it will be completely useless once this digital conversion happens and that makes me sad. EDITOR'S NOTE: If it has a connector for an external antenna, yes. Otherwise, no. I had a local outdoor antenna attached when I had satellite service years ago. I disconnected the service about three years ago but the local antenna still worked great. Now I cannot get my VCR/DVD player to work in color. I have made no changes to the connections at all. I have a two year old HD ready plasma TV. Do I need to upgrade my DVD player now? Let's face the truth, Digital TV is a failure. Unless you live very close to a transmitting station they are NOT using the power needed. My lady friend is in a rural area and she now gets a fairly herringbone video and some audio from the anilog broadcast on her HDTV she just bought. The old cheap tv did a better job. Soon she will get NO signal as she has the new TV but the signals are not sent out with enough strenght. I am living in a large city and have the converter box and UHF antenna and amplifier, but most of the time the signals drop out, and I am only a few miles away from some of the stations. I am just accepting the fact that by the end of June Television will be a thing of the past and I will need to get my information via the internet. As far as I can see this has been one great big failure. My friend has spent $400 or more and she gets nothing. I have only spent about $125 in upgrade stuff and my signal breaks up and is useless. Let's just admit it. TV is dead the end of June. It was nice while we had it, but soon it will be gone. What's more, of the so called 8 channels I get only 3 are worth looking at and only one, the weather thing with background music, is solid at least 55 percent of the time. I want to say there is a solution to the problems people are having why cant they have both digital and anolog tv.my opinion the goverment has wasted the money for converter boxes why mess with something that has work for years its just someone trying to get rich off a sceam my opinon digitals not better, digital should stay on satilite and cable leave americas tvs alone please let americans vote on it anolog would win by a landslide. The DTV switch is going to be a hit and miss situation based on particular locations, terrain, and distance from the transmitter. I live about 22 miles from the stations I receive. I used to get ABC and FOX via analog with an indoor antenna now with digital I get ABC,FOX,CBS,PBS(3),The CW,and MY TV network. I put an outdoor antenna on my back porch aimed to give the best reception possible (a compromise) for all of the stations and a 12db amp. I get great signal on all of the eight stations on one TV (I am using only an amplified "loop" in the bedroom and have problems with two of the eight there). I have noticed that like Satt TV digital signal does not like stormy weather and even on a clear day if it is windy (over 15mph) the signal is affected (transmitter tower sway?). My biggest complaint is about the stuttering and audio looping that happens from time to time. The only way to correct this is to turn the TV off and then back on. I thought this was a problem on only one channel at first but it has happened on several, signal strength does not seem to be a factor. Also I never had this problem until I switched from analog sets with converter boxes to 720p digital TV's. The Digital switchover is coming next month. i live in macon ga it only one analog station lift on. it a cbs station its been on since 1953.
but the abc nbc fox and pbs as went to digital tv. i been watching analog tv since the 1970's. We have a small television in our kitchen. There is no cable jack for this television. Should we purchase a standard analog-to-digital converter box, or is a wireless converter box available? EDITOR'S NOTE: If your TV has an external antenna connector, you will be able to use an analog-to-digital converter box. I'm not aware of any similar wireless devices. If your TV has a built-in internal antenna, you're out of luck, unless you're handy with a soldering iron. When the stations convert over to the digital signal, and shut down the analog signal, will the signal power of the digital signal be increased,or will it remain the same as when they were broadcasting the two seperate signals??? I have two TV sets for which I have convertors. Is there a way I can connect my convertors and connect my DVD/VCR players simultaneously, and switch functions accordingly? Is there another device I must purchase to make this possible- as there are provisions for only ONE set of three color cables on each respective television set?. I set up my converter box to my tv with a built in VCR. The VCR records fine if I push the button, but my timer recordings only record in black with no sound. I'm not sure why it records manually but not on the timer. HELP! A friend has a small portable analog TV that appears to have a built-in antenna. The converter box co-ax output to the TV input brings up a screen that says No signal. Can you plug a rabbit ears TV antenna into the converter box to get a signal without disconnecting the built in antenna. Or can you connect the built in antenna to the input co-ax on the convert box. EDITOR'S NOTE: I suppose it depends on how the TV is wired. Experiment! Why am I seeing the message "digital signal is low" on channels that previously had no difficulty reaching my inside antenna, broadcast- only televisions? The transition has cut my channel list almost in half. Although the images are better than the analog broadcasts, still, this is too much a hassle. And converters are not the same. some converters can pull in signals better than others. But the biggest pain is that the signals are unstable. Say, you were able to pull in Channel 7.1 if you move to another Channel then go back to Channel 7.1 later, you won't get the signal for Channel 7.1 anymore. You'll have to tweak, rotate, and move the antenna sideways, back and forth to get the signal again. And signals from some stations are difficult to pull in. The most difficult channels to pull in are the CBS 2 and My13 TV. Followed by NBC 4 and CW 5 then 11. In the order most difficult to difficult Easiest is 7.1, 9.1. 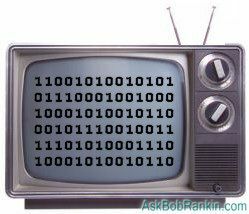 If some stations get low ratings it is not because viewer don't want to watch them, it is because there is "NO SIGNAL". I bought an antenna and converter box months ago, and on June 12 at 7:OO AM I scanned my TV and all was well, except I did not have channel 13. Unable to scan at that time, I came back later and re-scanned. No channels were strong enough to scan! I now have zip, zero, nada channels. If this is another example of how well the government is going to "take care of us" cradle to grave, we are in deep, deep trouble! I was there in the early 1970s when cable TV was started; it was $9.95 per month and NO commercials. After enough people got hooked the commercials started then the rate increases came. I started with satellite TV in 1998 when it was $19.95 per month. Every six months they raised the price until it reached $54.95 per month. Then I dropped it and went back to antenna TV. Then the free over the air TV went to a digital signal this June. I live in Daytona Beach and we get our TV from the Orlando stations. The digital signal comes and goes. Some days I get every channel clear and sharp, other days I am lucky to get one channel. Right at the most important moment the signal will click off and might be gone for the rest of the night. OTA digital TV is a disaster. The TV providers probably don’t care about the millions of antenna users because we are the poor. The loss of 5 to 10% of their market does not seem to worry them. The other 90% will pay and pay, not worrying one little bit about the cost, $10 a day, no problem those suckers will pay it. As for me and several million others just like me if the credit card companies wanted to charge me to use their product I will stop using them and I WILL STOP USING THE TV. Back to a good book. WE would like to continue to get free antenna broadcasting. Not all of us can afford to pay for cable t.v. or even need it. I have a BW portable TV and a hand-held LCD TV and can't get reception because they are both analog. Is there anything on the market to convert this type of equipment to digital? EDITOR'S NOTE: If they can use an external antenna, you'll be able to use the digital-to-analog converter. bob,I have purchased a pinncal dazzle dvd recorder so as I can transfer digital movies from the memory card of my samsung camcorder on to dvd's that will play on tv dvd combies & standard dvd players,this piece of equipment has worked superbly and has produced first class analog copies of our holiday that play on all my required dvd players, the only problem I have is being able to make a copy of one of these dvd's using disc to disc copy, each time I try the copied dvd it will not play on the players as will the dvd burned through the dazzle?? EDITOR'S NOTE: When you copy the disc, do you "finalize" it? Some software does not do that, and it often causes such problems. I need a digital converter box so I can still use my analog cable system television. I have been hearing a signal and voices in my home. I found antenna wire wrapped around chasy of trailer. Home is like a conduit?? Phone has been hacked repeatedly. What am I looking for?? Need some help please. Believe my sister is doing this some how?? Ears here constant ring,voices in thin air???? There's more reader feedback... See all 82 comments for this article.